With the wind rustling through the trees and the moonlight streaming down into the fort, Ernst made a decision: he hated nigh watch. It was cold, it was dark and there was nothing to do. Another dreary patrol of the western wall had reaffirmed his regret that he hadn’t joined the warband heading west and into the Karpothian Mountains. Fame, riches and most importantly, glory, would not be earned by babysitting the defenses of a sleepy town in the back end of nowhere! Ernst sighed, shouldered his musket and started walking back to the corner tower. A game of cards with Dieter would hopefully cheer him up. He’d leave Werner to ‘bravely’ hold the wall. 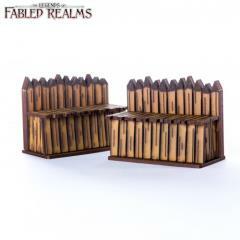 These walls are common throughout the Teuden League and are made of stout wood from the surrounding forests. The rampart below the walkway is filled with earth and stone to make it resistant to attacks from beasts and siege engines. This kit contains two 3" wall sections.